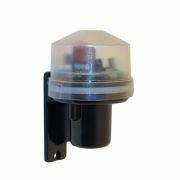 A range of outdoor PIR and dusk to dawn sensors designed for use in security lighting installations. They are also ideal for use where automatic courtesy lighting control is required anywhere around the home and garden (or business) PIR (Passive Infra Red) sensors are used to detect a person moving in the detection area and switch lighting accordingly. ​​​​​​​They sense a combination of body heat and movement to trigger and will switch on for a preselected time before switching off again. These also have a manual override facility so you can switch lighting on permanently (until switched off) Dusk to dawn sensors also known as Photocells are used to control lighting during the hours of darkness. They are designed to switch on at dusk and off again at dawn. The lighting controlled is therefore on all night.